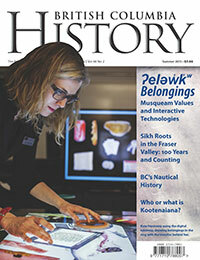 Check out the summer issue of BC History for lots of great stories. In the book review section, I have a hat-trick of reviews on BC’s role in the First World War – “From the West Coast to the Western Front: British Columbians and the Great War” written by Greg Dickson and Mark Forsythe as well as “From Classroom to Battlefield: Victoria High School and the First World War by Barry Gough and on a more peaceful topic- “Canoe Crossings: Understanding the Craft that Helped Shape British Columbia, by Sanford Osler. All are great reads by BC authors.